You really brigthened my day, both literally and figuratively! Thank you so much for “brightening” my vision once again. It was like a veil was lifted after you performed the laser procedure on the membrane. Even the floaters were at a minimum. I can see clearly and I am very grateful to you!! PRK has changed my life! Five years ago, I didn't think that I would ever be a candidate. However, your encouragement to trust the possibility of PRK gave me hope! With the fluctuations in prices as technology advanced and the medical restrictions grew (economically) tighter, your generosity rose even higher. Thank you so much for approving me for the payment plan. Without your generosity, I would not have been able to get PRK. 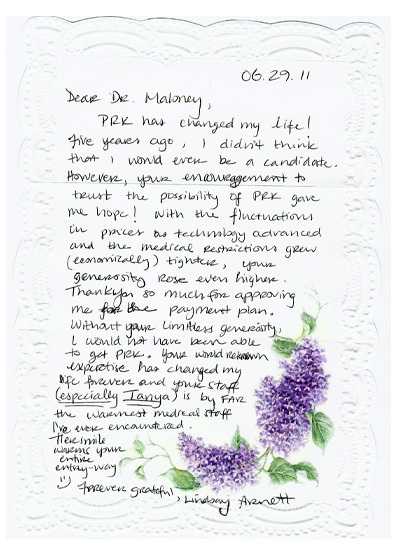 Your world renowned expertise has changed my life forever and your staff (especially Tanya) is by FAR the warmest medical staff I've ever encountered. Her smile warms your entire entry way. I want to thank you for giving me a new set of eyes. They work so great, I can't remember the last time I woke up and could see without the hassle of contacts or glasses. You have given me the chance to really see and use my eyes for something really important to me, my art and film. 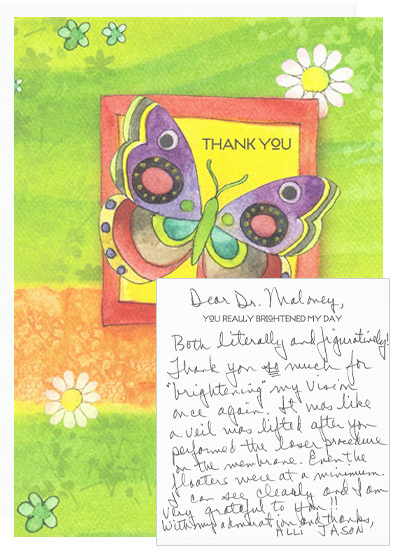 You, Dr. Maloney and the staff, have also been so great to me and I couldn't imagine any other experience. The nicest people to make this the least scariest and probably one of the most enjoyable procedures I have gone through. Thank you again! And I hope many other people will be blessed enough to experience and benefit from your services and care. I cannot thank you enough for your personal note thanking for my small gesture in bringing a cake for the office. I really appreciated your taking the time to acknowledge it! I would like to thank you and your most kind, efficient, helpful, patient and wonderful staff for the amazing care I've received from everyone. Would like to highly commend Britt – Dr Deal & all in the office. I want to thank you so much for my brand new eyes. It is so great to see everything in H.D. vision. You are amazing! and I truly appreciate everything you and your staff did to make me feel comfortable. 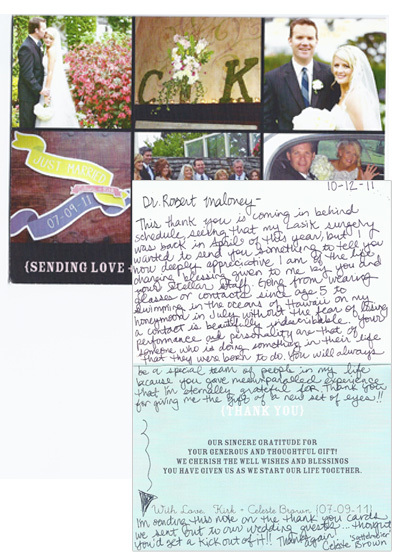 For ever grateful Dr. Maloney. It has been two months since my LASIK surgery with you and I couldn't be more pleased or more amazed with the results. I can now ride and jump horses without a worry of poor eyesight or lost glasses, besides the fact that all the annoyances and headaches of contacts and glasses are now behind me. Thank you so much for your excellent work, expertise and fantastic care of my eyes. I've recommended you to anyone and everyone and once my friends and family save their pennies, they will be on their way to you. Thank you again for my perfect vision! Today, after 36 years, I tossed out my contacts and glasses. For the first time in a year, my eyes were not irritated and dry. 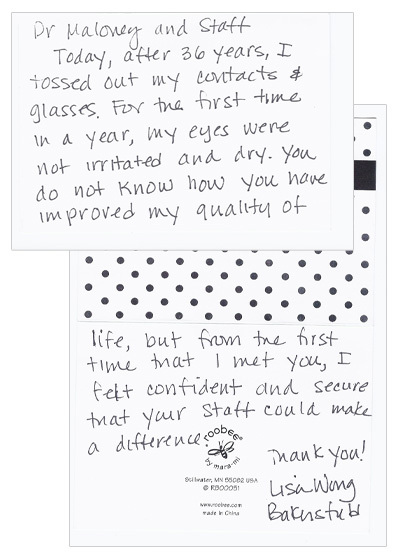 You do not know how you have improved my quality of life, but from the first time that I met you, I felt confident and secure that your staff could make a difference. I don't think I'll ever be able to say thank you enough times to adequately convey my deepest gratitude for everything you all have done for me! 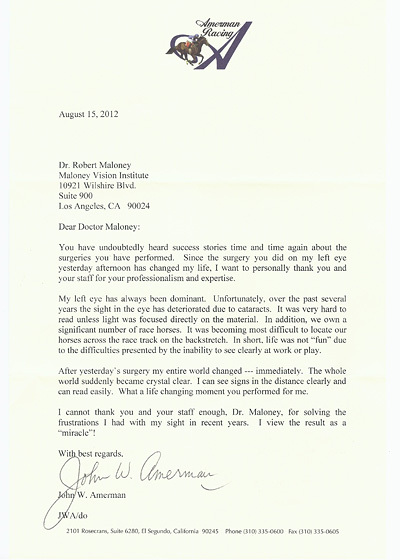 Dr. Maloney, you have changed my life forever—the original surgery and the touch–ups. I will be forever grateful and indebted. Dr. Deehl, you are amazing! 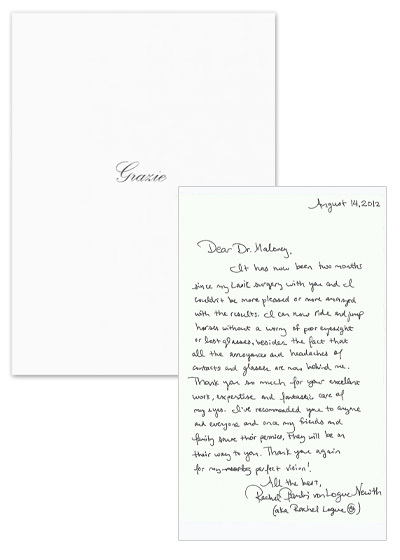 Your genuine sensitivity, understanding, personable approach & expertise sit very fondly in my entire experience. Dr. Eghbali — thank you for coming to my rescue! 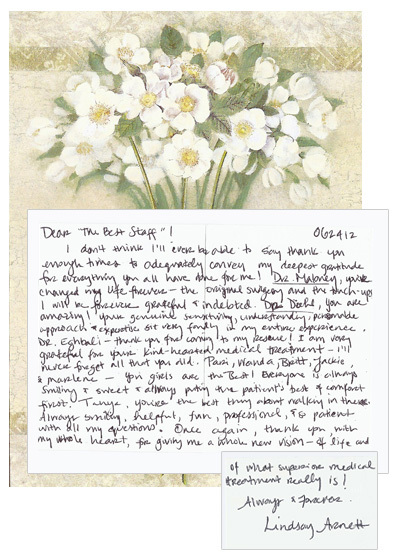 I am very grateful for your kind-hearted medical treatment — I'll never forget all that you did. Pari, Wanda, Britt, Jackie and Marlene — You girls are the best! Everyone is always smiling and sweet and always putting the patient's best of comfort first. Tanya, you're the best thing about walking in there. Always smiling, helpful, fun, professional, so patient with all my questions. Once again, thank you, with my whole heart, for giving me a whole new vision of life and what superior medical treatment really is! 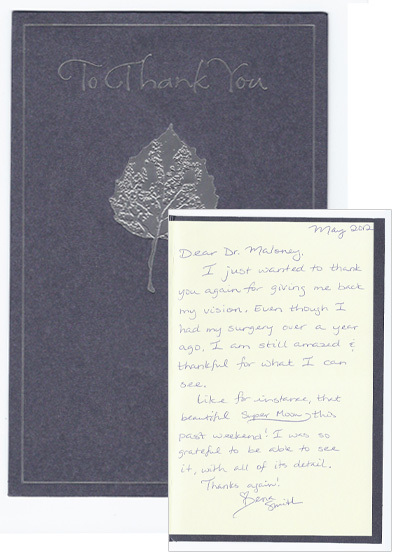 This thank you is coming in behind schedule, seeing that my LASIK surgery was back in April of this year, but I wanted to send you something to tell you how deeply appreciative I am of the life changing blessing given to me by you and your stellar staff. Going from wearing glasses or contacts since age 5 to swimming in the oceans of Hawaii on my honeymoon in July without the fear of losing a contact is beautifully indescribable. Your performance and personality are that of someone doing something in their life that they were born to do. You will always be a special team of people in my life because you gave me an unparalleled experience that I'm eternally grateful for. Thank you for giving me the gift of a new set of eyes!! I just wanted to thank you again for giving me back my vision. Even though I had my surgery over a year ago, I am still amazed and thankful for what I can see. Like for instance, that beautiful Super Moon this past weekend! I was so grateful to be able to see it, with all of its detail. Thank you for doing the surgery on my eyes. 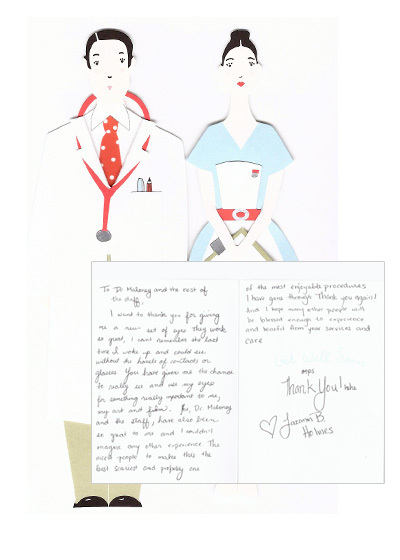 You also provided confidence for me during the procedures. Having such surgeries was not something I looked forward to doing. Today, I wouldn't hesitate to have family and friends seek your expertise. Also, your entire staff was really great. You have given me back a gift that I had lost year ago, new sight. I not only have new sight, but a fresh outlook on life. I now have the ability to live without the dependance on my glasses. Having the LASIK procedure with Intralase was the best experience and will have a life altering affect on my career. As a future dentist, my patients will be overjoyed that their doctor can now provide even better care, because of your gift of sight. Dr. Maloney, the atmosphere of your office was extremely inviting from my first step out of the elevator to my departure. Everyone in the office was exceptionally friendly. I loved the professionalism of your staff and the expertise each person displayed in their duties. 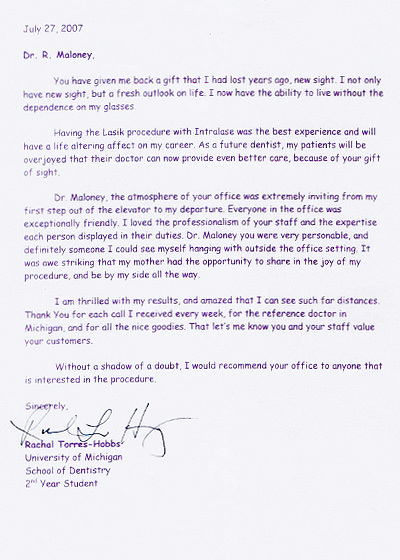 Dr. Maloney you were very personable, and definitely someone I could see myself hanging with outside the office setting. It was awe striking that my mother had the opportunity to share in the joy of my procedure, and be by my side all the way. I am thrilled with my results, and amazed that I can see such far distances. Thank you for each call I received every week, for the reference doctor in Michigan, and for all the nice goodies. That let's me know you and your staff value your customers. Without a shadow of a doubt, I would recommend your office to anyone that is interested in the procedure. Ever since I can remember I've wanted to be a Navy fighter pilot. 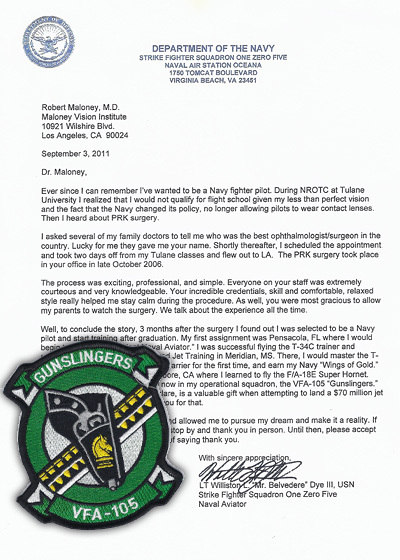 During NROTC at Tulane University I realized that I would not qualify for flight school given my less than perfect vision and the fact that the Navy changed its policy, no longer allowing pilots to wear contact lenses. Then I heard about PRK surgery. I asked several of my family doctors to tell me who was the best ophthamologist/surgeon in the country. Lucky for me they gave me your name. Shortly thereafter, I scheduled the appointment and took two days off from my Tulane classes and flew out to LA. The PRK surgery took place in your office in late October 2006. The process was exciting, professional, and simple. 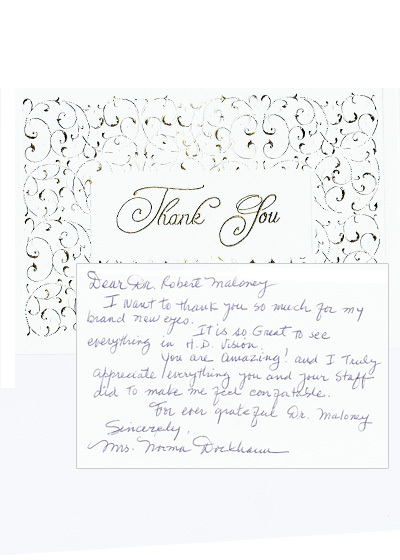 Everyone on your staff was extremely courteous and very knowledgeable. 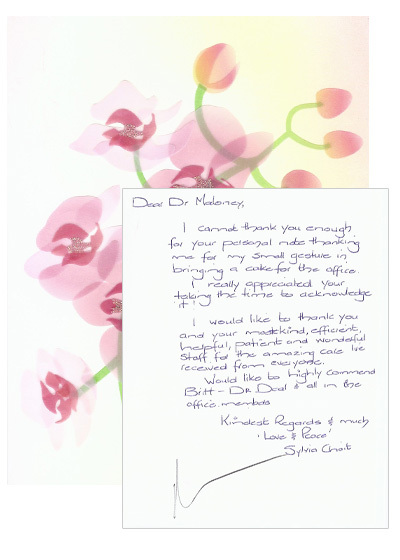 Your incredible credentials, skill and comfortable, relaxed style really helped me stay calm during the procedure. As well, you were most gracious to allow my parents to watch the surgery. We talk about the experience all the time. Well, to conclude the story, 3 months after the surgery I found out I was selected to be a Navy pilot and start training after graduation. My first assignment was Pensacola, FL where I would begin training as a "Student Naval Aviator." I was successful flying the T-34C trainer and subsequently selected for Advanced Jet Training in Meridian, MS. There, I would master the T-45C Jet Trainer, land on an aircraft carrier for the first time, and earn my Navy "Wings of Gold." From there I was assigned to Lemoore, CA where I learned to fly the F/A-18E Super Hornet. Five years after the surgery, I am now in my operational squadron, the VFA-105 "Gunslingers." My 20/15 vision, free of halos and glare, is a valuable gift when attempting to land a $70 million jet on a moving ship at night. I thank you for that. The PRK surgery changed my life and allowed me to pursue my dream and make it a reality. If my travels take me to Westwood I'll stop by and thank you in person. Until then, please accept this squadron patch as a small way of saying thank you. I just wanted to give you a brief update and thank you again now that it has been over two years since you performed LASIK on my eyes. I have to say that it has been an absolutely tremendous experience, and I am seeing just as well as now as the day after surgery. As a refractive surgeon and having been a principal investigator in clinical trials prior to FDA approval, I was certainly aware of the issues involved in LASIK. However, until I had it myself, I never fully appreciated all of the benefits it allows on a daily basis. I certainly had the choice of going to anyone, and I am proud to say that I very carefully chose to have you perform my surgery. Perhaps I had a unique perspective on choosing to be a patient of yours. Having worked together in clinical trials and having lectured together in training doctors across the country, I felt that I understood your approach to patient care. You always put the patient first with the greatest surgical expertise and clinical evaluations as well as the personal care you provide. This was absolutely my experience. Perhaps even more importantly, my experience with your staff was great as well. I felt like I received professional and personalized care at all times. The follow up calls were a great comfort and reassuring. it was important to feel like my care and my vision were important to everyone I met. Again, I appreciate your care and expertise and thank you for the vision that allows me to see clearly. 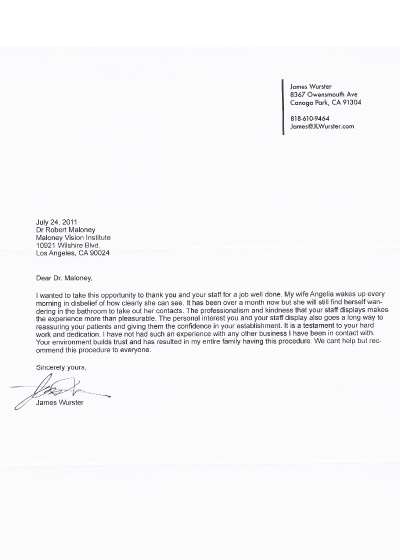 This is a letter to recognize the excellent medical care and service provided by you and your staff. I had worn glasses since I was in third grade and contacts since sixth grade. As a very active person, my contacts could be bothersome at times and would irritate my eyes. I had been waiting for my vision to stabilize before considering LASIK. Finally, in April 2012 my ophthalmologist recommended that I visit your office for a consult. I was definitely concerned about eye surgery and was quite worried about negative results. On every visit, your staff was unbelievably calm, kind and patient with me. They informed me of the tests, the process, and encouraged me not to worry. They were confident in you and in the procedure. I know LASIK is a very common practice nowadays...I was just a worrywort! At the time of the surgery you were fantastic! I felt comfortable and safe with my eyes in your hands. You talked me through the short procedure and I felt no pain. I was excited to go home and nap so my eyes would heal up. The next morning I woke up and could see! 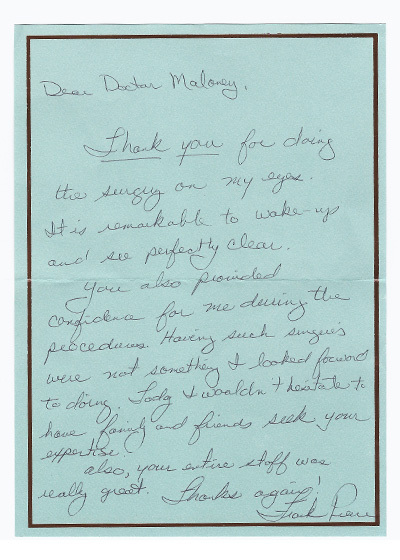 You had corrected my vision drastically and I was thankful. However, after a few months my vision wasn't quite perfect and objects were blurry; I was squinting a lot. I came in for an enhancement and the results are absolutely phenomenal! Everything is crisp and clear: life pops out at me! I am now in my early thirties and you have blessed me with perfect vision. I am beyond appreciative to you and your staff for giving me back what I hadn't had (without the help of glasses or contacts) since I was a child. I have nothing but praise for you and your outstanding staff. I wanted to take this opportunity to thank you and your staff for a job well done. My wife Angelia wakes up every morning in disbelief of how clearly she can see. I has been over a month but she will still find herself wandering in the bathroom to take out her contacts. The professionalism and kindness that your staff display also goes a long way to reassuring your patients and giving them the confidence in your establishment. It is a testament to your hard work and dedication. I have not had such an experience with any other business I have been in contact with. Your environment builds trust and has resulted in my entire family having this procedure. We can't help but recommend this procedure to everyone. I would like to thank you for giving me my vision back! I had been debating for a while on whether I should have the LASIK procedure done or not, and I am so grateful I found you. I could not have picked a better doctor. You, along with your staff, are amazing. You truly care about your patients, and it shows in the way you communicate with them and treat them. I have never had such an awesome experience with a doctor until now. Now that I had my surgery, I can see everything so clearly. I no longer have to look for my glasses at night when I want to watch TV, and I no longer have to deal with annoying contacts. I feel like I have been liberated in a way. I have been telling everyone I know about you and what an awesome doctor you are. I know you have helped thousands of people, and I just feel so fortunate to be one of them. I will forever be grateful to you because you have changed my life for the better. God bless you and your family. And once again, thank you. A thousand times... thank you!!!! It has been about a year since you performed the Artisan procedure on my eyes. Soon after the recovery, my life began to change dramatically. The day or so of slight discomfort seems so long ago, especially since the recovery time was so quick. Please accept my most sincere gratitude and appreciation, as you have truly changed my life. I am thirty-two years old and have been wearing some form of corrective lenses since I was five. Like so many others who have severely poor eyesight, I am essentially helpless without some form of corrective lenses. At some point, glasses/contacts ceased as a limitation and simply became part of my way of life. As a teenager, I switched to wearing contacts from glasses, which were (due to their Coke-bottle like appearance) the source of frequent looks of sympathy from adults and unkind comments from kids. While contacts seemed to work fine for the better part of fifteen years, my tolerance for wearing them seemingly came to an abrupt end one day. I noticed that my eyes became irritated more frequently. I often blinked to clear the debris in my eyes, and as a result, simply could not comfortably wear contacts as frequently as I once did. Even with the advancements in technology, I shuttered at the thought of constantly wearing glasses again. Since the procedure, I have been able to enjoy everything from the simple pleasures of seeing the basketball pass better out of the corner of my eye, falling asleep on my sofa without fear of my contacts drying out, waking each morning with the ability to clock, to the sublime benefits of, well...flat-out seeing better. Your genuine passion for what you do, empathy for my particular situation, and overall care for others comes out in your fingertips and provides an intangible level of assurance and comfort well before the actual surgery. Thank you for your blessings and talents that you have used to better my life and the lives of so many. Magical! Marvelous! Remarkable! Though only 6 days post - PRK/LASIK, I am seeing quite well and, for the first time in 45 years, able to see without contact lenses or glasses. My thanks are extended to you and your staff for the carefulness, attention and professionalism which has been delivered. Yesterday, after I had my healing contact lenses removed and excited about what my vision was like, I immediately described the day to my friends and family as the fifth happiest day of my life, ranking close behind the birth of my three children and my wedding day. I had a rather unique situation due to the Keratoconus in one eye and I am so glad that you were able to move forward with the procedure, in spite of it. And, I appreciate your patience as you examined me approximately two years ago but recommended, at that time, waiting. I had worn glasses since age 12 and contact lenses since my late teen years (I am 55). Unfortunately, my father could be quite heavy-handed in his discipline, at times, and caustic in his verbal reprimands. Thus, my memories of wearing glasses during my teen years became connected to negative images of myself and memories of getting my glasses knocked off my face. When I began to wear contact lenses around age 19, I was able to repress some of these painful associations of my glasses. But, in the last four months, I was reconnected to some of these painful memories of my adolescence as I had to wear my glasses daily as a result of becoming contact lens intolerant during these last four months. Now, however, I will live a life glasses-free (except for reading, which is fine!). And one significant benefit for me of living glassess-free is I am not reminded so frequently of an emotionally painful adolescence. It all sounds pretty crazy, I know, this negative association with wearing glasses, but this was my reality prior to the PRK/LASIK. God was been very good to me in my recovery journey from this and other childhood issues and my eye surgery last week has been an incredibly healing part of that recovery journey. Thank you and many blessings on you and your staff for the miracles you work daily!! 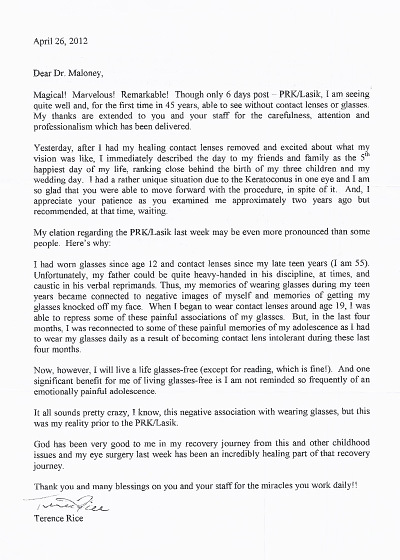 I am sure you must receive dozens of letters every week from patients who have undergone LASIK vision correction, raving about the results. I had my surgery about a week ago, and I can honestly say, this has been nothing short of a miracle for me. After 33 years of wearing glasses and contacts, and finally resorting to bifocals in recent years, I never dreamed I'd be able to function without glasses or contacts. 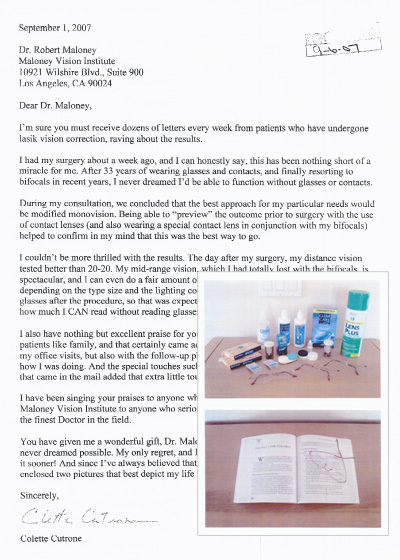 During my consultation, we concluded that the best approach for my particular needs would be modified monovision. Being able to "preview" the outcome prior to surgery with the use of contact lenses (and also wearing a special contact lens in conjunction with my bifocals) helped to confirm in my mind that this was the best way to go. I couldn't be more thrilled with the results. The day after my surgery, my distance vision tested better than 20/20. My mid-range vision, which I had totally lost with the bifocals, is spectacular, and I can even do a fair amount of reading with no reading glasses at all, depending on the type size and the lighting conditions. I know I would still need reading glasses after the procedure, so that was expected (and I am 58). The pleasant surprise how much I CAN read without reading glasses! I also have nothing but excellent praise for your staff. 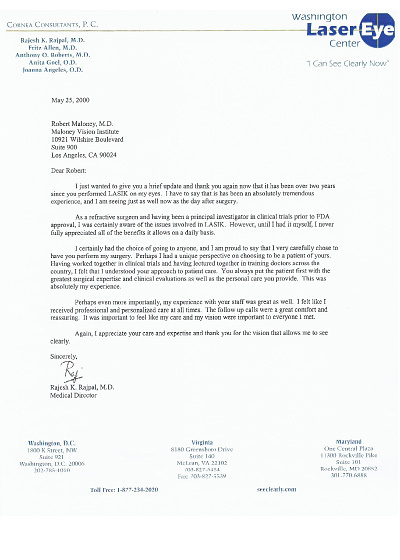 I know you believe in treating your patients like family, and that certainly came across in the way I was treated, not just during my office visits, but also with the follow-up phone calls after my surgery, checking to see how I was doing. And the special touches such as the coffee mug and the delicious cookies that came in the mail added that extra touch of "home". 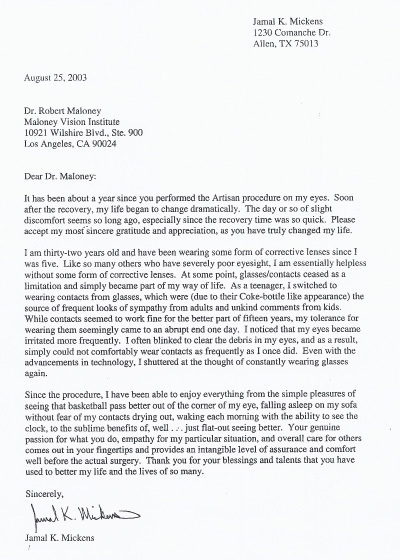 I have been singing your praises to anyone who will listen, and would heartily recommend Maloney-Shamie Vision Institute to anyone who seriously cares about correcting their vision with the finest Doctor in the field. 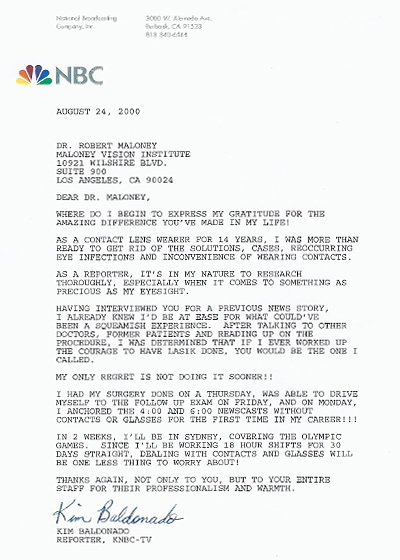 You have given me a wonderful gift, Dr. Maloney, by restoring my vision in a way that I never dreamed possible. My only regret, and I'm sure you hear this often, is that I didn't do it sooner! And since I've always believed that a picture speaks a thousand words, I've enclosed two pictures that best depict my life "before" and "after" LASIK! Where do I begin to express my gratitude for the amazing difference you've made in my life! As a contact lens wearer for 14 years, I was more than ready to get rid of the solutions, cases, reoccurring eye infections and inconvenience of wearing contacts. As a reporter, it's in my nature to research thoroughly, especially when it comes to something as precious as my eyesight. Having interviewed you for a previous news story, I already knew I'd be at ease for what could've been a squeamish experience. After talking to other doctors, former patients and reading up on the procedure, I was determined that if I ever worked up the courage to have LASIK done, you would be the one I called. My only regret is not doing it sooner!! I had my surgery done on a Thursday, was able to drive myself to the follow up exam on Friday, and on Monday, I anchored the 4:00 and 6:00 newscasts without contacts or glasses for the first time in my career!!! In 2 weeks, I'll be in Sydney, covering the Olympic Games. Since I'll be working 18 hour shifts for 30 days straight, dealing with contacts and glasses will be one less thing to worry about! Thanks again, not only to you, but to your entire staff for their professionalism and warmth. 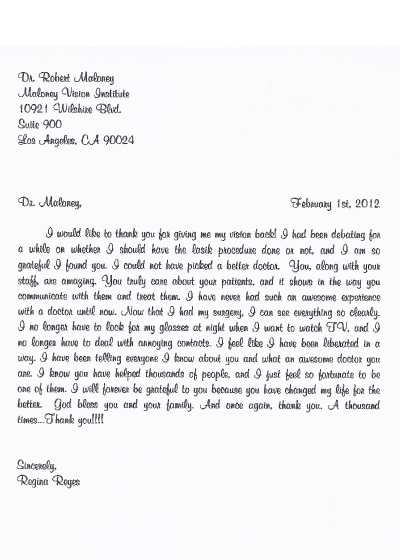 You have undoubtedly heard success stories time and time again about the surgeries you have performed. Since the surgery you did on my left eye yesterday afternoon has changed my life, I want to personally thank you and your staff for your professionalism and expertise. My left eye has always been dominant. Unfortunately, over the past several years the sight in the eye has deteriorated due to cataracts. It was very hard to read unless light was focused directly on the material. In addition, we own a significant number of race horses. It was becoming most difficult to locate our horses across the race track on the backstretch. In short, life was not "fun" due to the difficulties presented by the inability to see clearly at work or play. After yesterday's surgery my entire world changed — immediately. The whole world suddenly became crystal clear. I can see signs in the distance clearly and can read easily. What a life changing moment you performed for me. 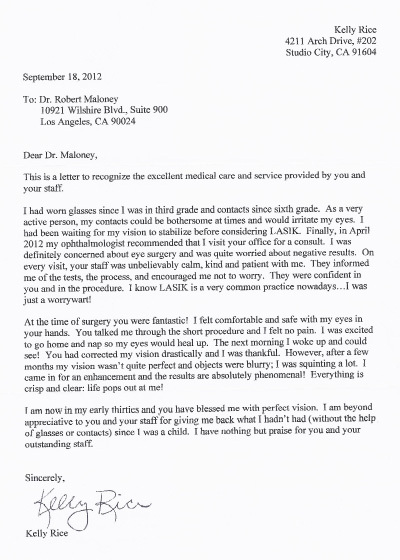 I cannot thank you and your staff enough, Dr. Maloney, for solving the frustrations I had with my sight in recent years. I view the results as a "miracle"!